Being responsible for thousands of items in a warehouse or store can be stressful. You’re constantly looking for relevant inventory management techniques and best practices to ensure you’re maximizing efficiency and minimizing costs. Well, we know your time is limited, so we narrowed down the many techniques available to three you can quickly review for implementing or improving within your organization. One of the most basic inventory management techniques that many organizations neglect is being purposeful and consistent with stock audits. While often a big headache, auditing your stock is a critical method for ensuring inventory accuracy. After all, how can you hope to have true inventory control if you’re not even sure what inventory you have on hand? The traditional time period for performing this arduous task is annually, which is certainly better than not doing it at all. However, a lot can happen in a year. For example, if there’s an error with an order one month after your last audit, that may result in inventory counts being off for the remaining 11 months. Subsequently, you may be faced with two costly scenarios. First, if you have less stock than is recorded, you may be unable to fill larger orders that come in. Second, for the same reason, you may be overordering and spending more money on inventory than needed. These issues then perpetuate throughout the year until it’s time for your next stock audit. There are two primary approaches you can take to remedy this problem. You can choose to audit your stock more frequently, such as biannually. Though such a task may be too challenging or costly if you have an exhaustive number of items. Alternatively, you can review your picking and counting processes and identify improvement areas. Making these processes more accurate and efficient will lessen the burden on your annual audit and reduce costs. 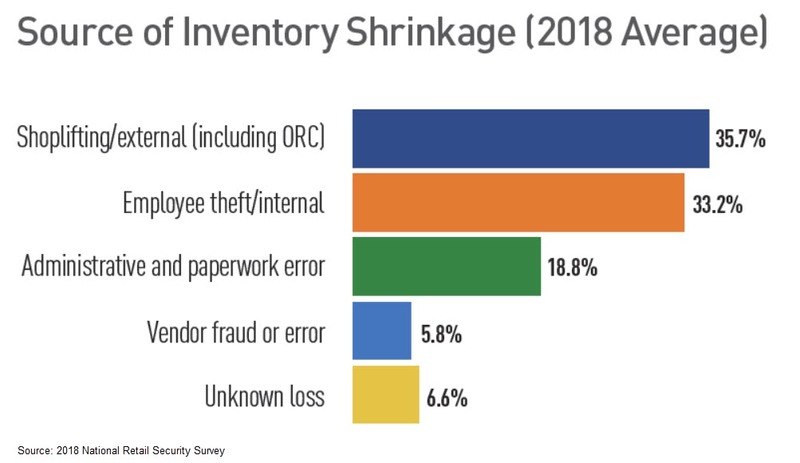 According to the 2018 National Retail Security Survey, inventory loss can typically be attributed to several reasons, mostly involving some type of theft or error (see image below). These events are inevitable if you maintain physical items, though they can be controlled to some extent. And there are some convincing stats for doing so. The same survey notes that one-fifth (20%) of respondents reported shrink costing 2% or more of sales. Add to that the potential lost business from not being able to fulfill orders on time (or at all) and you have a compelling case for minimizing shrinkage. Customer-related shrink. Institute or improve loss prevention systems such as burglar alarms, security cameras (with remote monitoring), electronic security tags, observation mirrors, and plainclothes store detectives. Employee-related shrink. Awareness and training programs are the most prominent. In addition, there are technology solutions like fingerprint ID at the point of sale. Clerical-related shrink. A digital system can reduce human error, but every system has a limit as long as human input is needed somewhere. Better training also helps. Vendor-related shrink. The only real change you can make here is being more selective about the vendors you choose to work with. Don’t focus purely on cost when choosing which vendor to partner with. Consider their processes, customer guarantees, and other qualifying factors. 3. Automate processes with inventory management software. Inventory management software helps not only reduce human error but ensure consistency in your operations. Employees are prone to handle processes the best way they know how (or in a way that makes their job easier), meaning process outcomes vary and/or there are added costs produced by their workaround efforts in the process. An inventory management system performs the same tasks the same way, every time. In addition, when properly configured—for example, by requiring certain human input before continuing to the next step—the system also helps employees adhere to the process you’ve carefully developed. Implementing such a system results in more efficient processes, predictable outcomes, and cost savings. Automate with insightful guidance from Factum. Factum is a boutique consultancy with a solid track record of helping organizations implement a wide range of enterprise solutions, including inventory management software. We understand that the software selection process can be a pain. Researching, identifying, and assessing vendors in the market can be tricky if you don’t know what to look for. Luckily, our knowledgeable consultants are here to help. Schedule your free discovery call today to see how we can help you make the right choice in an inventory management system and get your organization on the track to cost savings and greater efficiency.